This casket or forzerino is thought to have been made in Florence in about 1400, and would have served as an engagement present from a future husband to his betrothed. It is decorated with hunting scenes, the fountain of love and the wounded stag, which was as much a symbol of love as of the chase. The lid is inscribed onesta e bella , 'honourable [or rather, chaste] and beautiful', words befitting such an occasion. 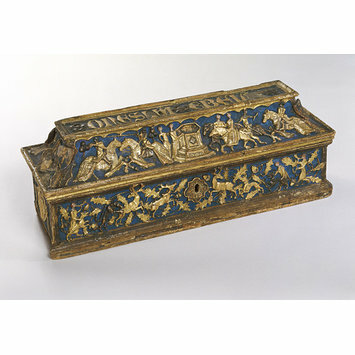 This lavishly decorated object is both parcel-gilt (that is, parts of its are gilded) and painted blue, a colour that was extremely expensive. Such luxury would have gone against the recommendations of the sumptuary laws that came into force in Florence in 1356 and were aimed at keeping the cost of weddings down. When it was acquired by the Museum in 1890, it cost the hefty sum of £467 9s 7d (£467.48), reflecting its lavish decoration and its romantic subject matter. No doubt the Victorians' love of all things to do with Medieval chivalry and courtly romances made it such a sought after item. 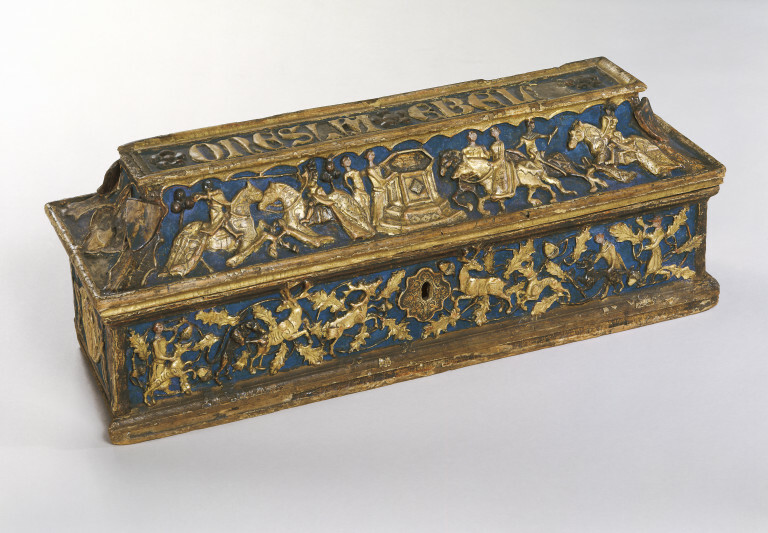 Lidded casket of elongated rectangular form, the exterior painted blue and gilded, with all four faces and the raised, hinged lid decorated with applied low relief moulded ornament which shows a procession to a fountain, hunting and tournament scenes, women among oak leaves, shields and roundels, and the inscription (along the top of the lid) ONESTA E BELLA. The box is of boarded construction, apparently dovetailed, with the boards mitred at the corners, and has applied mouldings (probably held with wooden dowels or glued) around the bottom (the mouldings heavily worn away at one end). The plain bottom is dowelled up into the sides, front and back. The lid is constructed from four concave sections, possibly dovetailed, on which is set a flat capping. It appears that a bead has been applied around the capping, and a moulding applied around the edges of the lid. The lid is held on three wire loop hinges, the central one missing its upper part. On the underside of the lid are the remains of fixings for a metal handle. On the front is an applied escutcheon decorated with flat scrolling floral ornament. An iron lock hasp is nailed into the underside of the lid, and the corresponding internal lock is missing (except for a fragment of metal). The plain interior retains traces of fabric weave in an adhesive indicating was once lined with fabric (possibly linen?). The wood is covered with a white ground below applied relief work (probably non-setting calcium sulphate with animal glue, modelled by hand rather than cast). On the back of the casket where female figures are missing drawn lines (for drapery) can be seen in grey on the white ground, apparently indicating the positions of these missing parts. An orange bole has been freely applied over the applied ornament, in places overlapping the adjacent background. During the gilding process some leaf overlapped the background but was subsequently covered by the application of blue paint as part of the original scheme. Most of the relief areas are water gilded, but the flowers on the lid, some of the horses and hounds on the front seem to have been covered with a silver-coloured leaf. (Traces of metallic grey can be observed in areas protected from wear, such as the recesses of the petals on the flowers on the lid.) The gilding and silvering is decorated with punch work using a single, small round punch. The faces of the figures have been painted over the gold. The shields at the corners have also been painted. The background is painted blue (apparently originally azurite in an egg-white size), and may have been painted over a second layer of white ground. Some areas of the blue back ground have been retouched using a synthetic ultramarine, mingling with the original finish. It is hard to determine the old paint from new but the older paint appears to be much brighter. The finish is worn with dirt in engrained in the punch work. The white relief work is lifting and there are numerous losses, particularly on the back. There some old repairs to the white relief work. Bought from Signor Bardini, 1 Piazza Mozzi, Florence, for £467 9s 7d (RF 6633/1889). The casket was exhibted at the Esposizione e d’ intaglio e intarsio in legno, at the Palazzo delle Belle Arti in Rome 1885. It was then in the collections of Attilio Simonetti. R.Hercolei in the Catalogo delle opere antiche d’ intaglio e intarsio in legno esposte nel 1885 in Roma …(Rome, 1885) p. 179, identified the coats of arms as those of the de Bilioctis and de Nerlis, two familes from Florence. The relief ornament on the sides and lid of this casket is applied gesso duro (a thickly moulded plaster). The subject of the decorative scheme suggests that the casket may have been a chivalric gift to a lady, perhaps on the occasion of her betrothal to the giver. The scenes depict knights hunting and jousting, ladies on horseback and standing beside the fountain of youth and other scenes from courtly life set amongst oak leaves and acorns. Hunting is an appropriate topic, as it was sometimes used in art and literature as a metaphor for courtship. The inscription on the lid reads "Onesta e bela" (honourable and beautiful) in Lombardic script, qualities presumably ascribed to the lady for whom the casket was intended. the heraldic arms of the couple appear at either end. In order to control the spiralling costs of weddings, contemporary Florentine sumptuary laws stated that betrothal caskets should not be too richly decorated nor too costly. However it seems that that this rule was frequently violated, and this casket includes man of the banned forms of ornamentation such as gilding, the elaborate courtly scenes (when only arms were allowed) and the pigment azurite which has been used to make the bright blue background. The union of opposites caused the poet to fall I love, first through the efficacy of “Bellezza,” her fine eyes “whence so many amorous darts were wont to sally,” and then through “Onestà,” defined as an ideal of virtuous behavior: “Gentle deeds, and speech wise yet humble.” Of necessity the coffer’s motto simplifies Petrarch’s thought, endorsing more wholeheartedly than he the virtue of love." Peter Thornton, Cassoni, Forzieri, Goffani and Cassette: Terminology and its problems, in Apollo vol. CXX (1984), no.272 pp.246-251, fig. 3. Wood with relief-decoration executed in gesso; painted and gilt. The top inscribed in Lombardic letters Onesta e bela (Honourable and Beautiful) suggesting that the casket was probably a chivalric gift to a lady. On the lid and sides are scenes of jousting and hunting and of courtly life.